A clean, spacious house with a nice pool and a well looked after interior. 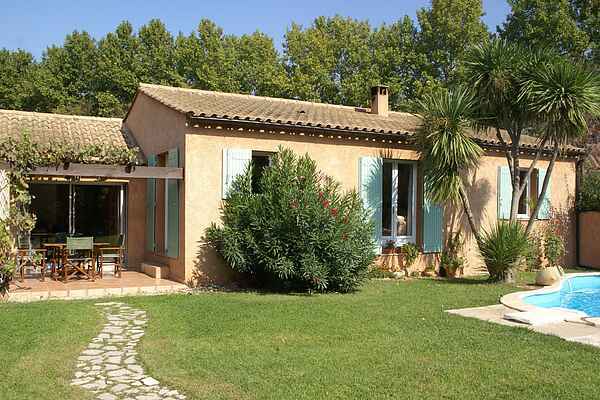 The house is in a beautiful and central location, ideal for excursions and trips. It is lovely and cool inside. You can enjoy your meals on the terrace and the setting is very pleasant. The detached villa is located in small residential area near the little village of Noves (1 km). In Noves you'll find a bakery, a butcher's and a supermarket. You can take trips to Avignon where you can visit the Papal Palace. Other options are a visit to Vaucluse (with Orange, Mont Ventoux, Vaison-la-Romaine, Carpentras, Apt), the Bouches-du-Rhône (with St. Rémy-de-Provence, Les Baux-de-Provence, Arles , Salon, the Camargue, beaches), Gard (with Alès, Nîmes, the Pont-du-Gard) and the Ardèche (Pont-St. Esprit, Vallon-Pont d'Arc and of course the Ardèche Gorges).